iMIDIPatchbay lets you organize your whole MIDI setup from one central point. Do you often divide your keyboards into zones to assign different sounds which might come from external sound expanders? Do you need to send Program Changes to your MIDI equipment? Well, then iMIDIPatchbay is definitely the right tool for you! 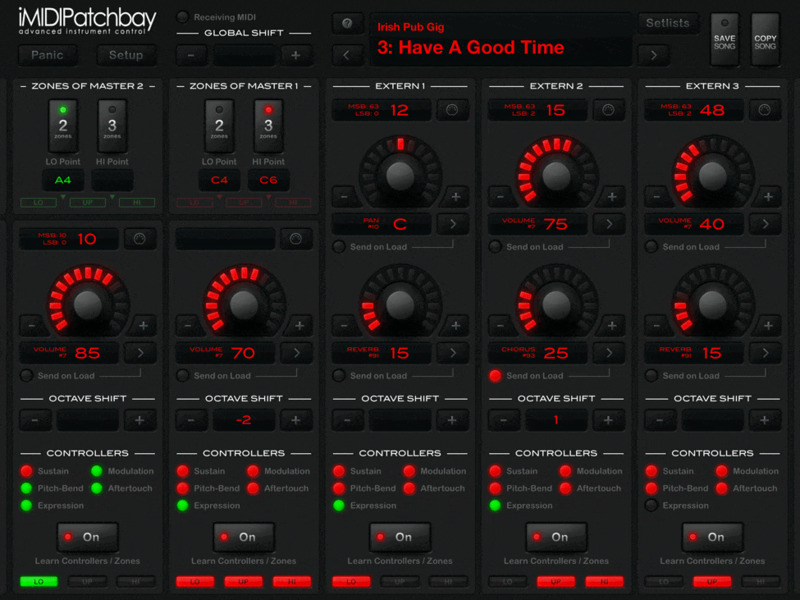 What's new in iMIDIPatchbay 1.4? 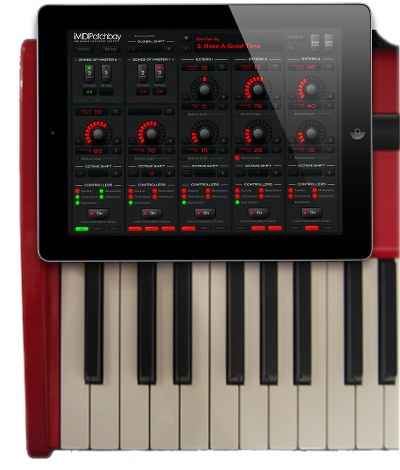 Do you love iMIDIPatchbay and think it's worth much more than the actual price in the App Store? Do you like the email support that you get for free? With the following button, you can easily make a donation and say "thank you" or tell me what new feature you would like to see in iMIDIPatchbay. And don't forget to write a review in the App Store. Thank you! What exactly can I do with iMIDIPatchbay? As a keyboard player, you most probably know about splitting and layering sounds. While this can be done relatively easy on professional keyboards, it becomes more complex if your gear consists of multiple keyboards and sound expanders. Let's say you want to play the internal piano sound in combination with a string sound of an external sound expander, but the latter should only be triggered by keys higher than middle C. For that, you need to a) select the piano sound on the keyboard, b) select the string sound on the sound expander, and c) make the expander only respond to notes higher than middle C. Although this is a small example, it still can be tricky if your sound expander has a small display and tiny buttons. And when performing on stage, you definitely have to switch both devices to the right program before starting to play. Everything becomes more and more complex if you intend to use more sounds and if you want controllers like pitch bend or sustain to affect only a subset of the active sounds. iMIDIPatchbay makes building such configurations a lot easier than it has ever been before. iMIDIPatchbay is divided into sections. There are four “EXTERN” sections which are used to send MIDI data to four sound sources. These can be on separate devices or in one multitimbral device, the only important thing is that each sound is listening on an individual MIDI channel or MIDI device. The four “MASTER” sections are used to send MIDI data back to the master keyboard. Using these sections usually only makes sense if the corresponding master keyboard is also a sound source, i.e. a normal keyboard with internal sounds. Above each “MASTER” section, you can find its split point configuration which is described below. The main purpose of iMIDIPatchbay is creating split and layer configurations for your sounds. For that, each of your master keyboards can be divided in to up to three keyboard zones called “LO”, “UP” and “HI” which are divided by two split points (”LO Split Note” and “HI Split Note”). You define the number of zones by pressing the buttons “2” or “3”, and define the split points by holding “Set LO Split Note” or “Set HI Split Note” and then playing the desired note on the keyboard. Read further to learn how to use that zones for individual sounds. By default, each section is off. You turn it on by tapping the ON button. When the section is on, all notes which are played on master keyboard number 1 (red) are routed to the corresponding sound source. By holding the same button, you select the keyboard zones which are active for this section: You can either hold and wait while the app cycles through the zone selections, or hold and play a note within the zone(s) you want to be activated. It is also possible to select no zone. By default, all control changes which are coming from the assigned master keyboard are routed to the sound source. However, you can easily filter out some of them by pressing the ON button and touching the desired controller, e.g. the pitch bend or the sustain pedal. You can reactivate it with another touch. It is also possible to use the controllers of different master keyboards. In the screenshot above, the section is assigned pitch bend and modulation (and notes) of master 1 (red) and sustain and expression of master 2 (green). As another example, you don't have to carry one sustain pedal for each of your keyboards anymore - just use one for all keyboards. 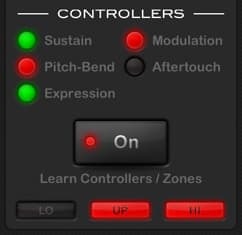 The supported controllers are sustain (CC64), after-touch, modulation wheel (CC1), pitch bend and expression pedal (CC11). All other controllers can be filtered out in the settings. Each “EXTERN” section has two parameter knobs and a parameter select button (“>”). With those you can control volume, pan, reverb and chorus of the sound source. Tip: Use two fingers to adjust the value more precisely. By holding “>”, you can activate “Send on Load” which will make iMIDIPatchbay send the value of the selected parameter always when the current song is recalled. 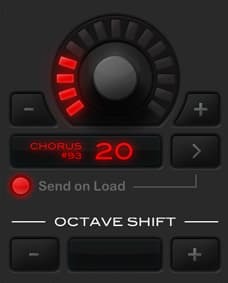 With the octave shift buttons, you can transpose the sound in 12-half-tones steps. iMIDIPatchbay allows you to control your sounds with up to four master keyboards, hence, you are able to play piano sounds with your weighted keys and synth sounds with your unweighted keyboard. But what if you have to leave one of them at home, e.g. for a small gig with limited space in the car or on the stage? With the "Master Switches" feature, you can easily exclude a master keyboard from your gear and trigger the assigned sounds with another master. All you have to do is going to "Setup" and setting "Device" and "Channel" of the master to those of another master keyboard. On the main screen, you will find buttons which let you quickly decide as which master the master keyboard should act now. You can even layer masters by tapping two or more buttons simultaneously. The great thing is: you don't have to change anything in your distinct songs. And as soon as you have all your masters keyboards with you again, you just need to set them back to individual input settings and everything works as before. 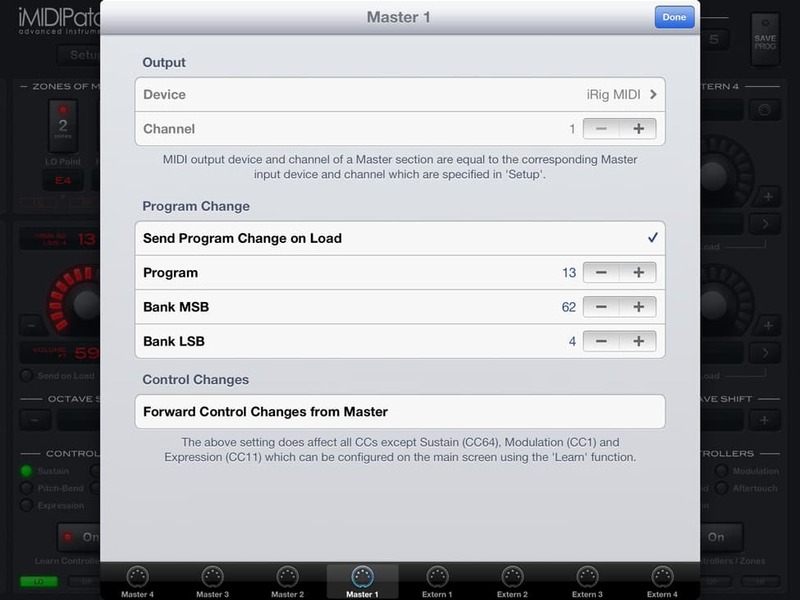 In the example in the left image, the masters 1, 2 and 3 are all assigned to the same device and channel. Currently, the master keyboard plays the sounds which have been assigned to master 2 or 3. If you never use four masters anyway, you can utilize "Master Switches" for quickly switching between sounds within a song. 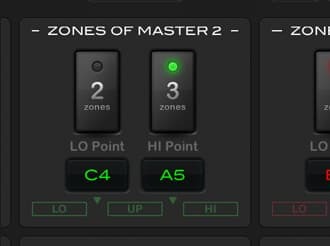 Assign one sound to master 1 and another sound to master 2 and make sure that both masters have identical "Device" and "Channel" settings. Now, you can switch between those sounds by toggling between the masters. After building your configuration, you can store it by pressing the “SAVE SONG” button. If you press “COPY SONG” instead, this will store the configuration under a new name. You can change the name of a song by tapping on the name in the display which will make the keyboard show up. After changing the name, don't forget to store. 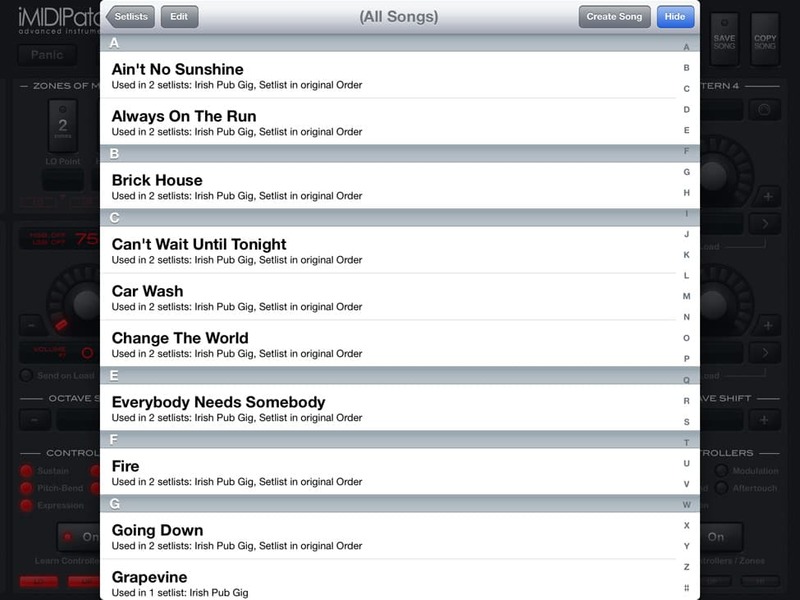 Besides naming and saving songs, you can create setlists and arrange your songs in them. Just press “Setlists” which will first show the screen to create and open setlists. After opening a a setlist, you can quickly step from song to song. If you press “Edit”, you can add, rename, delete and rearrange songs, and rename the setlist. When sending Program Changes to iMIDIPatchbay, it will switch to the corrensponding position in the currently selected setlist. If no setlist is selected, the songs will be recalled in alphabetical order. 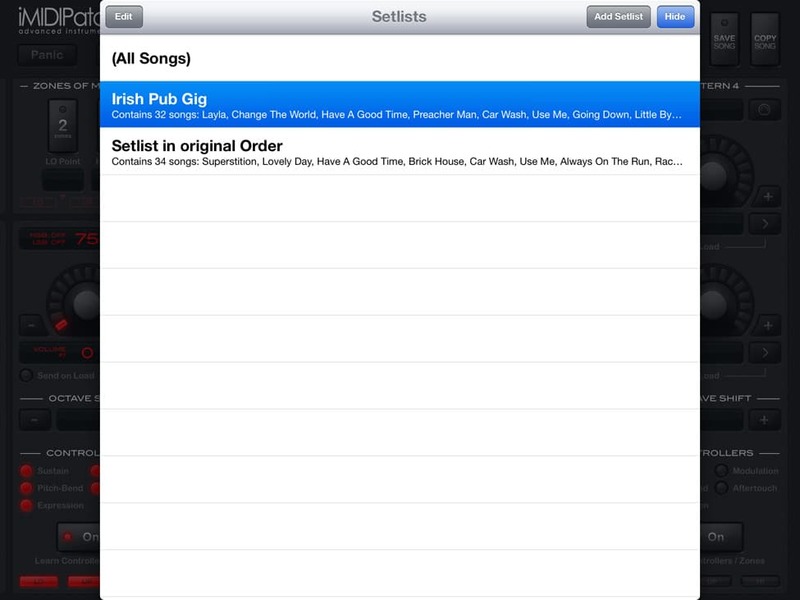 When displaying a setlist, you can add multiple PDF documents to each song. Select a song and press the “Edit” button and then “Insert Document”. 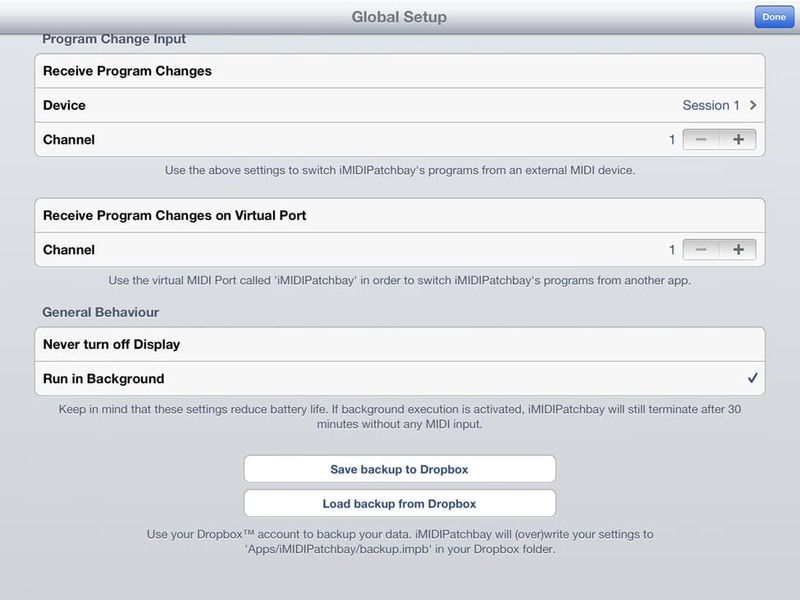 If you haven't connected your Dropbox account to iMIDIPatchbay yet, Dropbox will let you do that now. After that, you'll find a folder called “Apps/iMIDIPatchbay/Sheets” in your Dropbox. Any PDF file that you uploaded to this folder using the Dropbox app or from your computer, can be linked to a song in iMIDIPatchbay by pressing “Insert Document”. This will show a window with all files in that folder. Once a PDF is linked to a song in iMIDIPatchbay, it will be synced automatically. This means that you can even make changes to your PDF files afterwards without having to import them again. 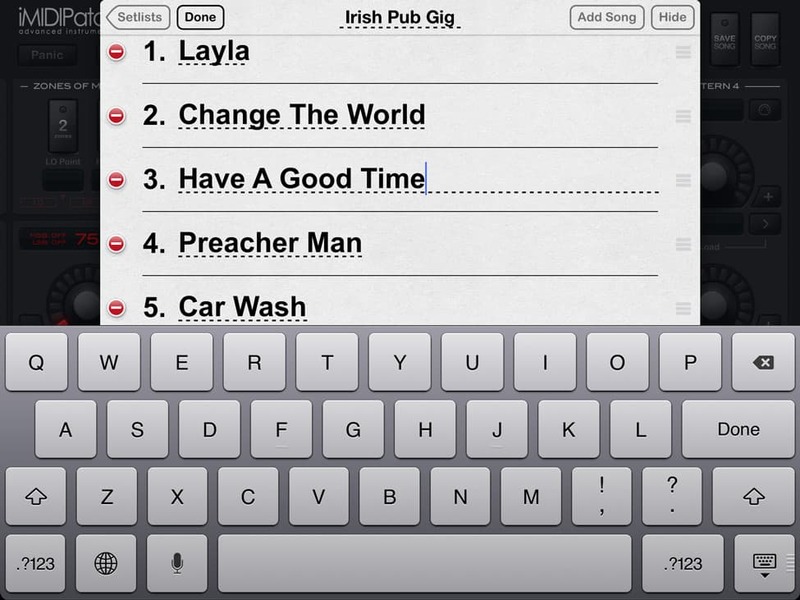 PDFs of a song are displayed next to the setlist if the iPad is in landscape. In portrait mode, the PDFs are below the setlist and can be slid up to cover the full screen. If you reached the end, you can easily jump to the next song. There is one thing you need besides your current gear (and besides an iOS device if you don’t already have one): a CoreMIDI interface. There are some on the market, e.g. iRig MIDI or iConnectMIDI. The latter offers many ports so it really is predestined to be used with iMIDIPatchbay. However, by using the THRU ports of your keyboards/sound expanders or external MIDI splitters/mergers you may also be fine with a smaller interface - it depends on your application. 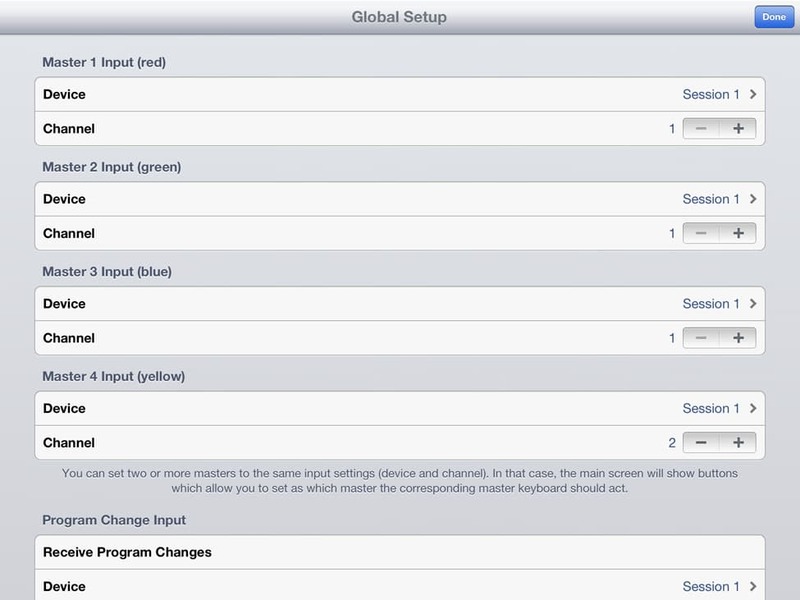 If you have a proper interface, connect your keyboards and sound expanders to the iOS device. 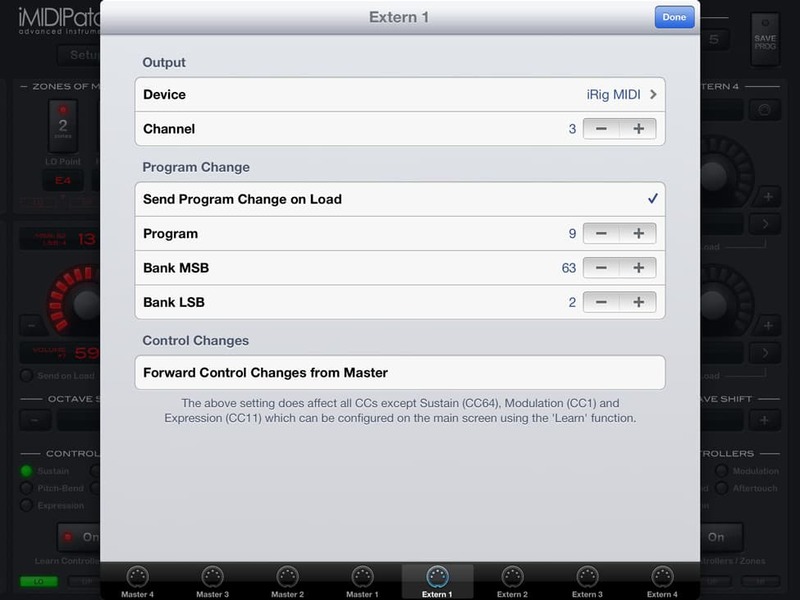 Then, press the “Setup” button and configure the “Device” and “Channel” fields so that iMIDIPatchbay receives the data of you master keyboards. The “MIDI IN” LED in the main screen should flash now if you play on one of your keyboards. In the main screen, press the button with the MIDI Icon to get to the section's settings. For each section, you need to specify “Device” and “Channel” where the corresponding sound source is listening. There are other options on that screen which allow you to switch the MIDI device to a specific program (given by MSB, LSB and program number) or to filter out control changes. What makes iMIDIPatchbay so special? iMIDIPatchbay aims to be used on stage. As I'm a live keyboardist myself and make frequent usage of the app, a great user experience and ease of use is taken care of. 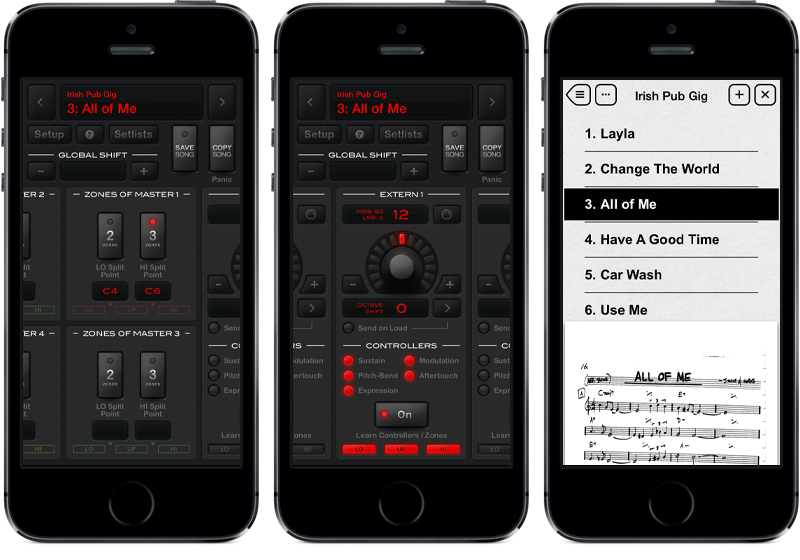 While some other apps also offer routing for MIDI data on iOS, none of them addresses the needs of live musicians. For example, iMIDIPatchbay allows to switch songs while still holding down keys without interrupting the sound. Furthermore, the user interface’s artwork fits nicely to real hardware devices.